More and more women are starting to get their gloves on for group exercise boxing drills in Salem, MA. Boxing for women is becoming more popular because of the many benefits it offers. It is a fascinating way to sculpt and tone muscles and it is more satisfying as you become stronger while doing it. Whether you’re punching a bag or skipping rope, women should try boxing training cardio workouts. On top of toning muscles, boxing training cardio workouts keeps your heart strong and healthy. This workout increases the rate at which your heart pumps blood throughout the body. Increased heart beats strengthens your heart muscles and reduces the chances of developing cardiovascular complications like heart attack and stroke. Additionally, boxing relieves physical and mental stress by increasing the production of endorphins which is your body’s feel-good chemicals. In effect, it gives your mood a natural boost. Since boxing is a high intensity workout, it burns a lot of fats and calories. An hour of boxing can burn 350-500 calories depending on your weight and the intensity of the workout. Joining boxing workouts class can tone your arms, legs, chest, shoulders and back and can even help you build a strong core. It is a whole body workout that involves every muscle in the body. Boxing is an excellent exercise for strength training to build up speed, power, and endurance and to keep your body in optimum health. Our body is like a living vehicle that we regularly abused and misused. Our body can become worn, tired, and inflexible because of the experiences and activities we put it through. Doing gentle yoga exercises helps you realize that you should not take your body for granted. Gentle yoga offers numerous health benefits and once you understand them you’ll get even more motivated to step onto your mat. Joining gentle yoga classes in Salem, MA is ideal for people who have not exercised in a while, for those who do high impact exercises regularly, and for those who are looking for a fitness program that is low intensity and and doesn't strain your joints. This relaxing workout has remarkable benefits. First, it improves flexibility and posture. During your first class, you may not feel very flexible and some of the yoga poses may be difficult. But, overtime you’ll notice a gradual loosening and eventually those challenging poses will become possible. Aches, muscle tightness, and back pain will also disappear. Second, gentle yoga increases your blood flow which can lead to a healthier heart. Lastly, it relaxes your system and helps your mind to focus. These are just some of the benefits yoga offers to improve your health. Practicing yoga regularly allows you and your body to relax. It can also ease your pain without pushing yourself too hard. With gentle yoga, it can relieve your pain. To find out more about gentle yoga exercise classes, contact Salem Fitness Center. Having a variety of classes in your weekly workout regimen is a fun and motivating way to achieve your fitness goals. This also prevents boredom from having only one type of daily exercise routine. Group exercise classes near Marblehead, MA incorporate workout routines that allow you to motivate yourself and others to dig deeper and push harder in workouts while having fun at the same time. It is inspiring and motivating to work out with dedicated, like-minded individuals. It doesn’t get much more empowering than a class with an encouraging certified group exercise trainer while being surrounded by supportive people all working hard together. Your fitness trainer shows you the proper form and ensures that everyone in the class is performing each exercise the right way to prevent injuries. Group fitness exercise is a fun an enjoyable way to exercise with upbeat music, a great workout plan, and a group of people motivating each other along the way. Joining group exercise classes can help build a foundation and structure that you can use to fuel your personal health journey for many years to come. 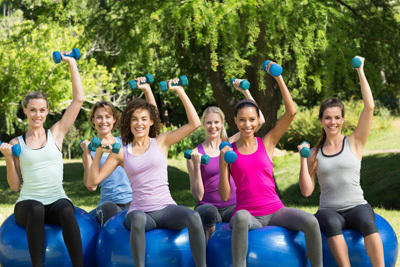 To find out more about group exercise classes, contact Salem Fitness Center. With your current fitness routine, you are may be getting slimmer and close to attaining your targeted weight goal. However, you also could be wondering why have you stagnated in your weight loss progress. Here’s a fact, when your body is used to the exercise you regularly perform, you reach what's called a "weight loss plateau". In order to achieve a leaner and more defined figure, you have to incorporate a toning exercise into your daily workout. If you are looking for a less complex and fun exercise that can help tighten your sagging skin and shape your muscles, Zumba Toning is the perfect toning workout for you. Zumba Toning Exercise integrates a targeted body shaping workout with intense cardio work as you perform Zumba movements to form a calorie-burning and power-boosting dance party fitness routine. With the use of Zumba toning sticks, you exercise every muscle group as you jive to the Latin beat. The program is designed to tone and redefine upper and lower extremities as well as your core muscles by adding lightweight resistance to the dance routine. So grab your toning sticks, it’s party time! Trim those muscles as you groove to the beat. Get the shape that you wanted while you have fun, contact Salem Fitness for more information.